The history of the Lippizaner Stud Farm is indivisible from the history of the Habsburg dynasty who ruled baroque Central Europe for 650 years. With just a short drive from Koper, the Lipica estate is within 45 minutes of scenic ride. Once you pass the geographical border of the Mediterranean coast, you are greeted in a new region, called the Karst. Its signature stone houses, wide meadows and the lush green fields and forests are spiced up with the traditional north wind called burja. If you experience its strong breeze you will be lucky to feel the freshness. A visit to the Lippizaner Stud Farm hides in its inside the beauty of the nature, which transmits into the grace of the white Lipizzaner horses and strong Linden trees that surround the estate. For guests who recognize and appreciate a dedicated tailored tour, for individual preferences of Oceania Marina’s guests, we organized a private horseback riding in the countryside, with the supervision of a professional trainer; exploring the estate by a Lipizzaner drawn carriage; a private walking tour of the stallions’ stables; and a training presentation of the stallions by their trainers. The visit embraced the essence of the estate in order to offer an in-depth visit in accordance to the private requests of the guests. And finally, the twist, a special lunch at a small private wine cellar in the Karst village of Ocizla. The guests were greeted by an open fireplace, under a 50 years old Walnut tree charming with its autumn coloured leaves. The lunch included the tasting of domestic wines and Karst specialties prepared in front of our guests by the owners. The grandmother was in charge for homemade potatoes gnocchi, prepared just minutes before they were served with a traditional game goulash. The men, on the other hand, were in charge for the wine production in the house, the guests did have a first taste of the vin nouvelle from this season. The younger generation of ladies were in charge for the decoration and seasonal appetizers before the grandmothers desserts. The nut cake potica, traditional Slovenian dessert, was made by following a 100 years old family recipe. 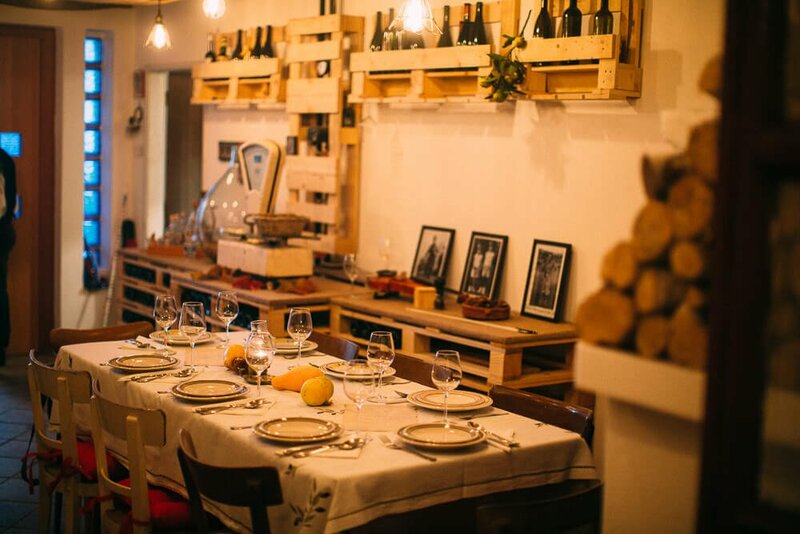 All of this was enriched with a trio of musicians singing Slovenian traditional songs – all above can only be described as a true happening which has taken the breath away from our guests. Their short but captivating feedback: “amazing people and food…something we’ll most likely never experience again…absolutely beautiful”. All our guests who have read this short presentation are also more than welcome to participate at the time of your choice.